Creeping Raspberry, Rubus hayata-koidzumii in a partially-to-mostly shady spot beneath a large crape myrtle tree. In shady areas, Creeping Raspberry seems to spread faster with less mounding. UPDATE 4/9/14 - This may be evergreen in warmer climates, but in USDA zone 6/7, after a winter with a low temperature of -2 Fahrenheit, it seems to have died back to the roots and is only now emerging slowly as an herbaceous perennial. It may yet make a good perennial, but gardeners in the colder parts of zone 7 and anywhere in zone 6 should probably not expect Creeping Raspberry to serve as a reliably evergreen groundcover. 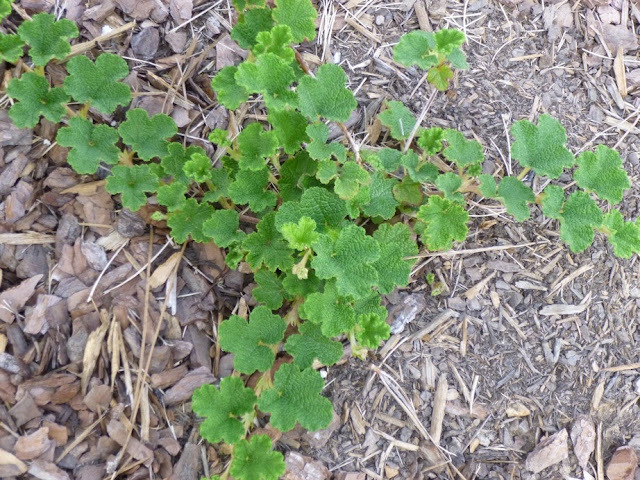 UPDATE 3/4/15 - This plant has since been shovel-pruned from Garden of Aaron. Click here to find out why. - Evergreen foliage. Always a plus in a groundcover. Plus I'm head-over-heals for this particular foliage, which is charmingly scalloped and crinkly and fuzzy. - Spreads at a good pace, by which I mean that I can actually see appreciable growth on a week-by-week basis, but growth is not so fast that I'd worry about keeping it in bounds later on. Plus it spreads by above-ground stolons, not below-ground rhizomes, which means it should be much easier to pull it up or chop it off if parts of the plant start spreading into unwanted areas. - Tough! Grows in full sun or partial shade (haven't tried full shade). It is supposed to be very drought-tolerant. Handled the winter cold (hardy to zone 6), spring wet and summer heat without batting a (metaphorical) eyelid. I will say that the plant sort of hunkers down for the winter. I don't think it grew at all then (although it was just settling in) and the foliage acquires a ruddy reddish glow, which makes it even more appealing in my book. In full sun, Creeping Raspberry still spreads laterally, but it also seems to mound up a bit more in the center, perhaps trying to shade its central core from the sun? I ended up transplanting this plant from a spot with afternoon shade to one with all-day sun. Despite being dug up and put at one of the windiest and hottest corners on the property, Creeping Raspberry has performed like a champ. It even produced a flower, but I pinched it off so that the plant would put all its energy into roots and foliage at this point. - Benefits wildlife and people. Creeping Raspberry produces white flowers (I've seen one, but pinched it off so that the plant could concentrate on vegetative growth) that reportedly attract bees. Pollinated flowers turn into orange berries that are reportedly attractive to birds and also edible (and tasty) for people. The berries are small and sparse enough that most folks say you shouldn't expect to get bowls and bowls of fruit from a Creeping Raspberry patch, but I think I'd be thrilled to get any edible benefit from a groundcover. (In the Pacific Northwest, on the other hand, berry production may be abundant.) I've also read that it may be possible to use the leaves to make a mild tea. - Reportedly very easy to propagate by detaching rooted stems / stolons. - Not native to the Southeastern U.S. In fact, it's native to Taiwan. This may actually be the only plant I've come across in my gardening research that's specifically native to Taiwan and it makes me wonder what other gems they might be hiding there. - Honestly, I can't think of anything else. It does not shine my shoes or make me breakfast. - Why doesn't everybody plant this? I know that I'm planning to buy more and hopefully propagate / divide the ones I have once they get bigger. 5-stars! I'm wondering if two things may have affected your success with creeping raspberry. One; how much sun was it getting? Its a raspberry and in my experuence, does best in full sun. Two; how heavy was your soil? I currently live in the western US, but grew up in the east. 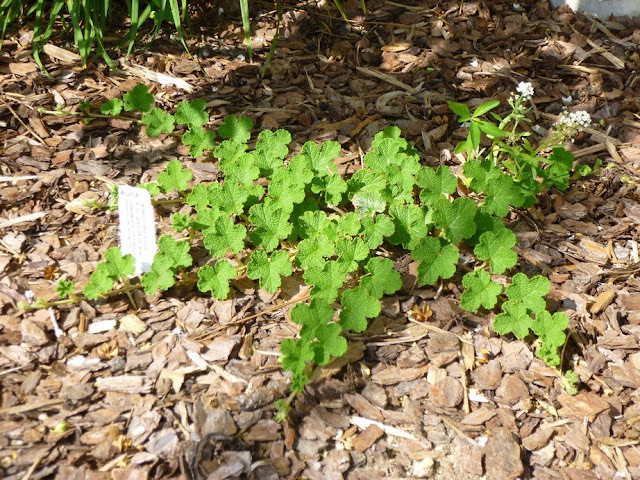 Creeping raspberry is doing great out here in the hot sun and sandy, well drained soil. It may just have been not the best selection for under the crepe myrtle. Creeping raspberry definitely performed better with more sun. I had one specimen in full sun that thrived and spread. I did end up pulling it out however this spring. It never bloomed and I was a bit concerned that it was spreading uncontrollably. And despite spreading some rampantly, it wasn't doing a good job of blocking weeds and looked awful for much of the winter and created work in the spring when I had to cut back the dead stems. Ours has become a complete bully and a thug. I can’t keep it contained and it wants to take over the entire garden. It’s woody roots and stems tunnel deeply horizontally and are very hard to dig up. I am shocked everyone loves this stuff. We live in Washington, across from Portland Oregon. It gets a full southern exposure. And not surprised to hear that creeping raspberry has become a bully-thug in the PNW. Are you going to try to remove it? As I mentioned in my other post (http://www.gardenofaaron.com/2015/03/what-creep.html), the good news is that creeping raspberry did not come back once I shovel-pruned it. Of course, I removed mine from the garden after just a few years when I saw the writing on the wall. If yours is more established, I'm guessing the eradication will be much more difficult. Perhaps you may need to resort to one-time herbicide use? Or maybe hard-pruning followed by smothering under mulch (organic or plastic)? If you find a way to control or remove it, I hope you'll come back and comment again so other readers can learn from your experience. Good luck! !